“Back to basics” is a phrase that has commonly been used to describe the fact that there are certain basic fundamentals required in every aspect of life. These must precede the more advanced teachings. However, for some people, the basics have either been neglected or ignored. This is evident at sporting events whenever athletes make the wrong play. Sometimes the reason is obvious—a neglect of the basics! This is also true in Christianity. There are specific fundamentals of the faith that are basic to a meaningful, victorious, and fruitful Christian life. And yet just what are the “basics?”According to Hebrews 5:12, the first principles of the oracles of God are essential for every believer. This is because they are the foundational truths upon which the Christian life is built. Only when you build your life upon the foundational truths of God’s Word will you be able to go on to maturity. Many sincere believers have missed the significance of having a firm foundation for their Christian faith. They have attempted to build a magnificent spiritual superstructure just to see it collapse. Why? It is because the spiritual foundation of their lives was not substantial enough to support it. Yet, there is a marvelous life available to everyone as a generous gift from our loving Creator God. Tragically, far too many will miss out on it. God has provided the way, but we must each accept it personally. Jesus Christ emphasized this when He said, “Enter in at the strait gate: for wide is the gate, and broad is the way, that leads to destruction, and many there be which go in thereat: Because strait is the gate, and narrow is the way, which leads unto life, and few there be that find it” (Matthew 7:13–14). May you be one who truly finds it! As a believer, you have a marvelous Christian heritage that offers fulfillment, contentment, and enjoyment just waiting for you. 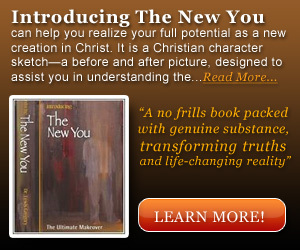 So, what are the “basics?” Introducing THE NEW YOU is a description of the basics, and it is designed to be a handbook for believers on the fundamentals of the Christian faith. Hopefully, it will help you avoid many tragic pitfalls, as well as make some beneficial course corrections.